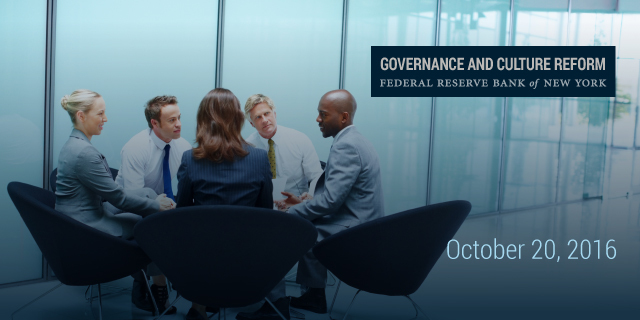 The New York Fed will host a one-day workshop examining culture and behavior in the financial services industry from a variety of perspectives. This event built upon two conferences that the New York Fed held in October of 2014 and November of 2015 on culture and behavior in the financial services industry. At this year’s workshop, we expanded the dialogue to include the perspectives of institutional investors and financial institution supervisors, discuss methods of culture assessment, and explore the influence of technology on culture. See a final list of participants and detailed summary of discussions . 33 Liberty Street, New York, N.Y.
Download the attendee list . The workshop will be open to the press. Chatham House Rule will be in effect for all but selected speeches; media may report on comments made during the event, but may not attribute remarks to individuals or organizations. Media who wish to attend should contact Andrea.Priest@ny.frb.org. Please address any questions to NY.FRB.Culture.Workshop.2016@ny.frb.org. Read President Dudley's panel preview on Medium. Read Maureen O'Hara's panel preview on Medium. Read David Walker's panel preview on Medium. Read Kevin Stiroh's panel preview on Medium. Read Stuart Mackintosh's panel preview on Medium. Stephen Cutler, Vice Chairman, JPMorgan Chase & Co.
Read Bill Schaninger's panel preview on Medium. Read Thomas Glocer's panel preview on Medium.